December has been a relaxed month for the horses. With poaching threats high and a few festivities in between, the horses have been able to enjoy a nice holiday on the summer grass. The plan for the New Year is to bring the horses back into fitness ready for some long patrols in the cooler months. Unfortunately, Lilly has taken a little backwards step in her training last month, all the horses are very fresh on the summer grass. She will need a little more time and patience to get her back on track. Fortunately, the team are determined to make 2019 a success and we are redoubling our efforts with her handling. Bev is looking very round at the moment and really enjoyed her Christmas holidays. Now it’s time to get back to work she’s bucking up her ideas (quite literally), ready for an exciting year ahead. King has been the star of the show this month! 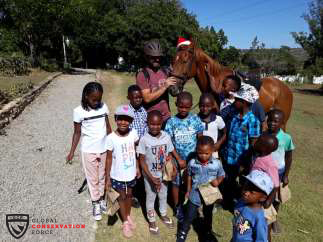 On Christmas day, King and Ali got dressed up in their finest Santa hats and delivered treats to the village children. The day was a massive success! When he isn’t busy delivering presents, King likes to make friends with the local wildlife. The picture below is of King meeting our hand reared Kudu, Nibbles, for the first time. Whilst Nibbles was very brave, it took King a short while to accept his new friend. Lilly is has being monitored closely with the high daily temperatures to make sure she does not get sick again. TPR’s are done on all horses weekly, but a visual check is done daily when feeding and grooming. Fortunately, she has not showed any signs of tying up (muscle cramping) and was well behaved while being ridden and lunged (exercised on a long line in a circle). 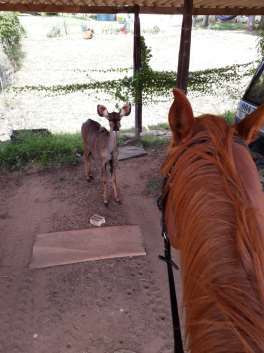 For the time being, Lilly is only being worked by Annie while the rangers improve their riding and horsemanship. Bev has also been very good when it comes to riding. She is well behaved, although lazy at times. Qurijn seems to know all her issues by now and how to handle them. She has shown significant improvement in the last 2 months in leading the outride, as well as falling in behind the leading horse. She does not stop as often and has become easier to handle. King has been doing really well and behaving fantastically when it comes to outrides, whether he is alone or accompanied by another horse. He has been very calm when other animals approach him and does not spook as easily, even when going through the village when checking fences. 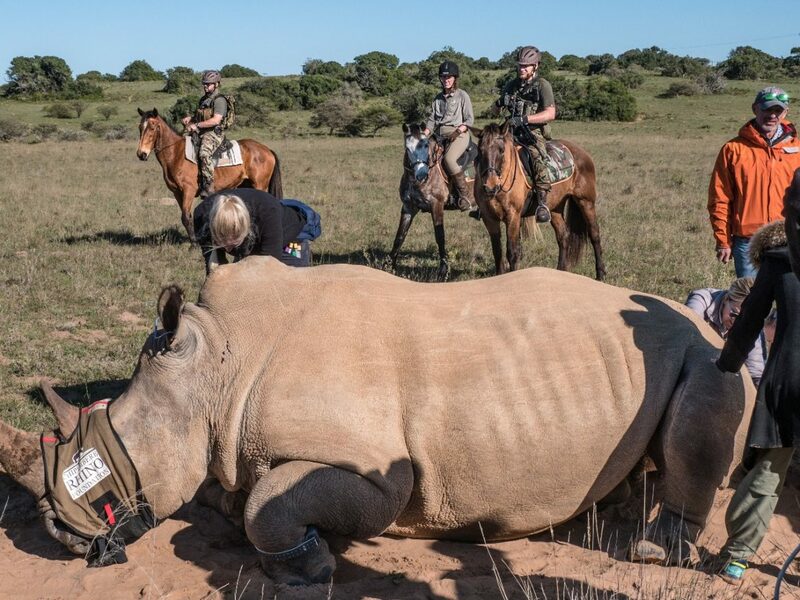 He has also stolen the hearts of some guests who were very intrigued with the project and the concept of doing anti-poaching work on horseback. 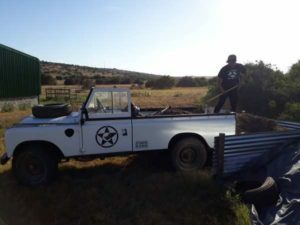 With our groom, Lithemba, having been on leave over Christmas, our rangers have stepped up and performed all the usual husbandry skills and taken over Lithemba’s general daily chores. Mucking was done thoroughly and grooming kits cleaned daily. With Lithemba’s leave, the importance of his role within the unit was highlighted and every one realized the importance of unity. 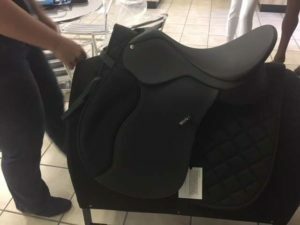 Our new saddles have arrived at Western Shoppe and need to be picked up. The saddle fitters will come out to fit them on the 8th of February. Thank you to all donors who have made this possible through supporting the project and work tirelessly to make the project possible. 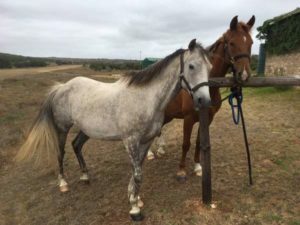 We would like to say a massive thank you to Blue Steel Equestrian in P.E who are kindly sponsoring our horses’ feed for a whole year! The horses’ diets have been kindly tailored to their breed and work by the fantastic staff and all the horses are looking fantastic. They are a perfect weight and their coats have never been so shiny. We are so grateful for their help in once again supplying our feed for the past month and stocking us up for the month ahead. Poaching is still a very real threat that the Eastern Cape faces, having the highest percentage of increased poaching for the last year. The rangers are constantly on high alert, on or off duty, and still balance the shifts as best they can. 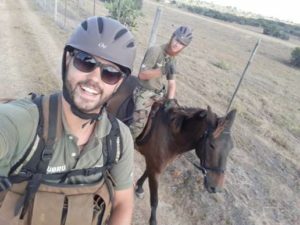 Amakhala has now dedicated time slots within shifts to help the rangers get the best hours in for riding lessons and general saddle experience. We would like to say thank you to everyone who has made this project possible and keep supporting it.